Mircom is pleased to announce the availability of our newest addition to the extensive TX3 line of Voice and Card Access products. As part of our launch, we are offering a show special to all customers, even if you are not attending ISC West. Contact your Sales Representative or our Customer Service team for details today! 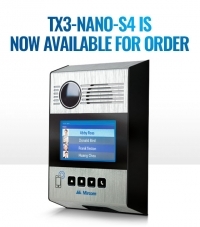 The TX3-Nano-S4 is a compact Video & Voice Entry solution, designed for indoor & outdoor protection of small, medium or large Residential or Commercial buildings. Weather resistant, surface mount design mounts to any single gang box or the TX3-Nano-BB (recommended for outdoor applications). Local or Remote programming using the built-in web/browser configuration utility. Illuminated multi-line color display name directory with grouping. Positive visual identification of visitors is provided by a built-in camera with Infrared Illumination (when using MiEntry mobile application via SIP). Stand-alone or networked with existing TX3 systems, up to 1000 residents, 2 Inputs & 1 Output.